Venture från turistleden och upplev livet på den här helgedagsturen från Chengdu. Utöva din fina färdigheter på en traditionell marknad och njut av en 1 timmes vandring till byn Chen Jia Xiang, där du kan träffa byborna och fördjupa dig i det lokala livet. Efter en utsökt hemlagad lunch (ingår) på en lokal bondgård, vandra tillbaka till ditt fordon och resa till den antika staden Huanglongxi. Beundra Huanglongxis Ming och Qing-era arkitektur och vackra tempel, stanna sedan vid en traditionell tehus innan du går tillbaka till Chengdu. First, we cannot say enough about or guide, Rudy, He was not only knowledgeable but personable. This is a trip we would highly recommend. We saw rural China which is much different than urban. Went to farm market and bought fresh produce to be used later for a wonderful home cooked meal cooked over a wood fired wok by the farmer's wife. I only wish I could get Chinese food like this at home. We also picked and ate fresh oranges at the farm. Best I ever had November trip. This was the perfect culmination of our 3 days in Chengdu. Pleasant trip and visit to a touristy ancient town that was very crowded. Country trek was a wonderful experience. Most enjoyable walk and lunch. This was a more authentic experience. I enjoyed my guides company. i had a great time in the countryside. the trekking bit could have been more intense than a village walk. but overall very good tour. Nice roundtrip at the countryside, visiting local market, walking at the country side, diner at the farm, which was pretty nice. This was a magical day. Highly recommend. Our trip to the market, trekking, lunch and then the ancient village ...All Brilliant. 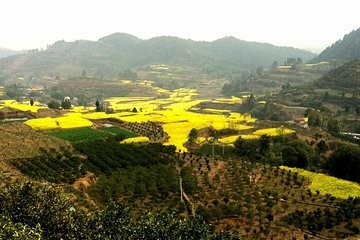 This was a fabulous tour for anyone who wants to get out into the Chinese countryside. Guide was local and knew exactly where to go, had lots of information about the local rural life, agriculture, plants, lifestyle. I have been in China for 3 months now, and my best meal was at the local farmhouse that hosted us for lunch. We bought a mushroom from an elderly lady along the way and the farmhouse host cooked it, along with lotus root, chicken and vegetables for lunch - not oily or salty like city/restaurant chinese food. This day is one of the best days I spent in China!